One question I am frequently asked is: why weren’t there objections made to prevent the channelization of the Kankakee River? I’ve wondered the same thing! I subscribe to a historic newspaper database; it is a fantastic research tool! In my investigation into the subject the best comparison I can come up with is the controversy over the proposed Illiana Highway. I follow the planned project because of its effect on the Kankakee River basin. There are many comparisons! Times were different a hundred years ago. Today there a number of environmental groups fighting the Illiana Highway project and even taking legal action to stop it. I find almost no newspaper articles about groups trying to stop the straightening of the Kankakee. I do however find a report made to the U. S. Congress in 1916 from the Secretary of War over the proposal. 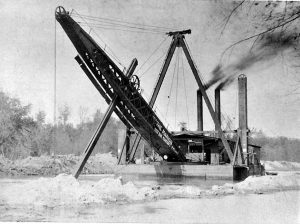 The report was an examination “with a view to devising plans for the flood protection and determining the extent to which the United States should cooperate with the States and other communities and interests in carrying out such plans, its share being based upon the value of protection to navigation.” Originally the channelization of the Kankakee was proposed to improve navigation. Later it was sold as means of flood control. The report chiefly focuses on the issue of leveling the limestone rock near Momence, IL, but speaks much of the total character of the Kankakee and its channelization. There is a lot of information in the report. The final sections were public input on the matter. To me it’s clear that letters submitted by landowners mostly stress the increase of land value after channelization. The final letter addresses the environmental impact. It was submitted by the Marion County, Fish and Game Protective Association. There is no question that there was flooding before the channelization of the Kankakee and yet, to this day, we continue to see severe flooding of the Kankakee. Much is spent in maintenance of the levee embankments. What real gain has been achieved and what have we lost? My next column will discuss public awareness and work being done to restore wetlands lost with the ditching of the Kankakee.